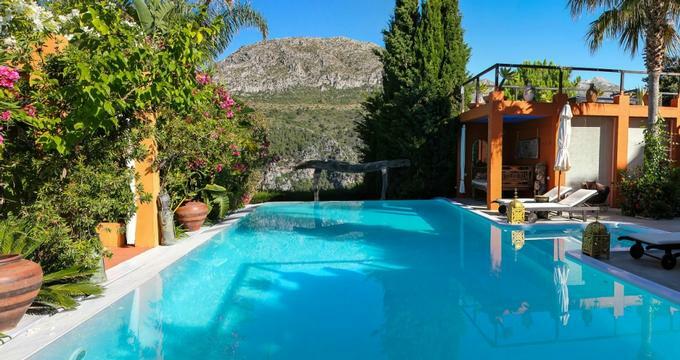 DDG Retreat is a luxurious retreat in the hills of Andalusia, Spain with breathtaking views over the Gibraltar and Africa coast. The exceptional residence offers the ultimate in privacy and seclusion with three magnificent guest suites, two of which are ultra-cool glamping tents. Surrounded by lush, tropical gardens, lodgings have private plunge pools and extensive terraces with hot tubs and sun loungers where guests can unwind in style, and first-class facilities at the retreat include a heated swimming pool, a full service Turkish Hammam, a fully equipped fitness center and gym, table games, badminton, racquets and tennis balls, and a fully stocked library. DDG Retreat features three magnificent guest suites surrounded by lush, tropical gardens, two of which are stylish and sophisticated glamping tents. Nestled in the beautiful tropical garden, Casa Pino offers absolute privacy and solitude with spectacular views over to Gibraltar and the African coast. Designed for seamless indoor-to-outdoor living, this stunning abode features a king-size bed with designer linens, goose down comforters, and hypoallergenic pillows, and an en-suite tiled bathroom with a walk-in shower, bidet, double vanities, and a WC. The suite has a spacious sitting area with comfortable seating, a mini-kitchen with a stove, microwave, dishes, cutlery and fridge, a Nespresso maker and coffee, a plasma television with a selection of movies and a CD Player with a selection of music, and a wine cabinet stocked with award-winning wines. The suite features a private terrace with a garden, a plunge pool/Jacuzzi with outdoor lounging area with sun loungers, a day bed and an outside bath, and a barbecue area with outdoor dining table and chairs. Additional amenities include a pillow menu, complimentary wireless Internet, and a specially prepared scent upon arrival (Thai, Frangipani, Lemongrass). The Royal Tent Bambu is decorated with unique and luxurious furnishings that create a perfect blend of style and comfort and exceptional facilities. Spanning 500 square feet in size with breathtaking views over Gibraltar, African coast, Pueblo Blanco Casares and the sea, the Royal Tent features marble floors, a king-size bed with designer linens, goose down comforters, and hypoallergenic pillows, and an en-suite tiled bathroom with a walk-in shower, bidet, double vanities, and a WC. The suite has a spacious sitting area with comfortable seating, a mini-kitchen with a stove, microwave, dishes, cutlery and fridge, a Nespresso maker and coffee, a plasma television with a selection of movies and a CD Player with selection of music, a Dolby surround sound system, and a wine cabinet stocked with award-winning wines. A private terrace has a hot tub on the cliff edge and a relaxing chill out zone. Additional amenities include a fully stocked mini bar with brandy and whiskey, pillow menu, complimentary wireless Internet, a bottle of Champagne on ice upon arrival, and a specially prepared scent upon arrival (Thai, Frangipani, Lemongrass). Upgrades include daily continental breakfasts and housekeeping services. Luxury meets elegance at the Maharaja Tent, which is an exotic retreat with spectacular views of the surrounding picturesque mountains. Surrounded by Cipres trees and Oleandro plants, this magnificent tent features 60 square feet of space and has a king-size bed with designer linens, goose down comforters, and hypoallergenic pillows, and an en-suite tiled bathroom with a walk-in shower, bidet, double vanities, and a WC. The tent has a fully equipped kitchen with a stove, microwave, dishes, cutlery and fridge, a Nespresso maker and coffee, a plasma television with a selection of movies and a CD Player with a selection of music, a Dolby surround sound system, and a wine cabinet stocked with award-winning wines. A 400 square foot private terrace has a plunge pool, outdoor bath and shower, sun loungers, a pretty pergola, and a barbecue area with dining table and chairs. Guests can add daily continental breakfasts to their stay with an upgrade to their accommodation package. Breakfasts include homemade granola, yogurt, cereals, fresh fruit, freshly baked pastries and bread and hot entrées. Freshly brewed artisan coffee, imported teas, and fruit juices are also available. Complimentary amenities and services at the DDG Retreat include heated swimming pool, a full service Turkish Hammam, a fully equipped fitness center and gym, table games, badminton, racquets and tennis balls, and a fully stocked library. There is free parking for guests, complimentary wireless Internet around the property and an array of concierge services. Guests are welcomed with a specially prepared scent upon arrival (Thai, Frangipani, Lemongrass). Additional paid services range from platters served for lunch or dinner, spa treatments, airport transfers, and taxi services. DDG Retreat does not cater for events, but offers a special Honeymoon Package, which includes a seven-night stay in the Maharaja Tent, a bottle of wine and fresh fruits upon arrival, two platters of choice for lunch or dinner, daily breakfasts, complimentary Nespresso coffee and selection of teas, complimentary minibar (stocked upon arrival), 10% off spa treatments, and a gift on arrival.